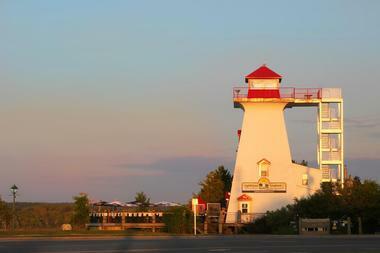 Lighthouse fans will find a diverse selection of beautiful lighthouses all around Canada. Some are historic structures in remote places while others are popular museums, restaurants and hotels. 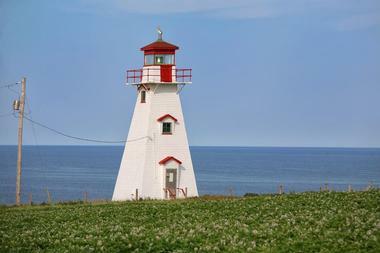 Plan a weekend getaway or a day trip and explore these fascinating lighthouses in Canada. Hidden military bunkers and 19th century buildings are just a few of the attractions at Fort Rodd Lighthouse, a structure that sits atop Fort Rodd Hill. The lighthouse served as a coastal artillery fortress from 1895 to 1956. Aside from viewing the lighthouse, tourists can easily explore the barracks, military posts and gun batteries that are located on the property. Fort Rodd Hill also has designated picnic areas and plenty of space for bird-watching, wildlife-spotting and photography. In the summer months, visitors can stop by the Canteen Building for some souvenirs and light refreshments. Located on idyllic Prince Edward Island, the West Point Lighthouse was erected in 1875 and is currently the tallest lighthouse on PEI. During the early 1900s, the lighthouse served as a guide for pilots training at the nearby British Commonwealth Air Training Schools. Today, West Point Lighthouse is now a museum, restaurant and hotel. The hotel features 13 guest rooms which are all housed within the lighthouse structure. Local attractions include the town of West Point, the beach boardwalk, Cedar Dunes Provincial Park and the West Point Marina. The hotel is open from June to September. Peggy's Cove Lighthouse, also known as Peggy's Point, is located on the shores of Nova Scotia. It is the main attraction on the popular Lighthouse Trail scenic drive. 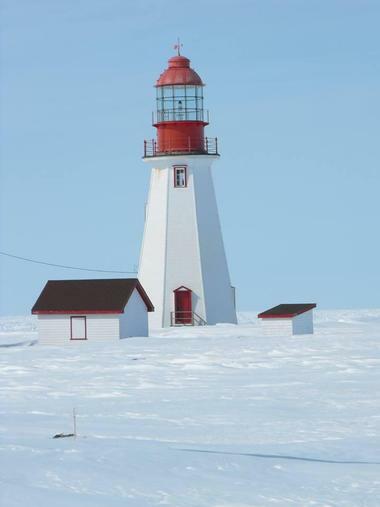 The red-and-white lighthouse is currently used by the Canadian Coast Guard to mark the entrance of Margaret's Bay. Built in 1868, the 49-foot-tall lighthouse has been deemed one of the most recognizable lighthouses in the world. Visitors can walk around the base of Peggy's Cove Lighthouse and explore the granite outcropping that extends out toward the Atlantic Ocean, but tourists should use caution since storms and large waves can make the area unsafe. Unique among lighthouses, the Cape Spear Lighthouse is a short structure with a wide base. The lighthouse sits atop the Avalon Peninsula near St. Johns, Newfoundland, which happens to be the easternmost point of the North American continent. 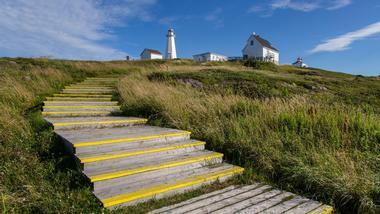 The lighthouse also marks a key spot on the East Coast Trail, a 340-mile-long coastal hike. Built in the early 1830s, Cape Spear Lighthouse underwent a restoration in 1955. The lighthouse is now known as one of Canada's National Historic Sites. Visitors can easily explore the base of the lighthouse and take photos of the dramatic scenery that surrounds the site. 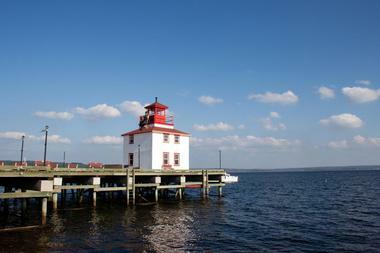 Lighthouse on the Green, also known as Fredericton's Lighthouse, is located on the banks of the St. John River. The lighthouse is an ideal destination for a day of family-friendly fun. At the on-site restaurant, visitors can enjoy a variety of scrumptious seafood dishes along with fresh-made ice cream. After lunch, guests can climb to the top of the lighthouse to see panoramic views of the St. John River and the town of Fredericton. During the summer, the lighthouse is open everyday, and during the fall, winter and spring months Lighthouse on the Green operates on weekends only. 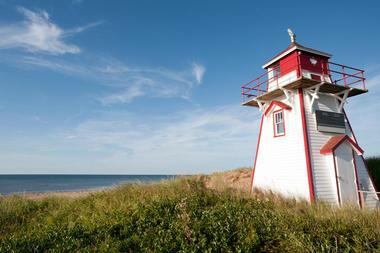 Located on Prince Edward Island, Covehead Harbour Lighthouse sits inside Prince Edward Island National Park. Erected in 1879, the lighthouse is still used to guide ships near the mouth of Covehead Harbour to this day. A plaque on the lighthouse commemorates the victims of the Yankee Gale, a powerful storm that took the lives of 150 people in 1851. The wreckage of nearly 100 ships was strewn across the beach following the unexpected tragedy. Today, visitors can walk around the perimeter of the 26-foot-tall lighthouse, take photos of the dramatic coastline and swim in designated areas along the beach. 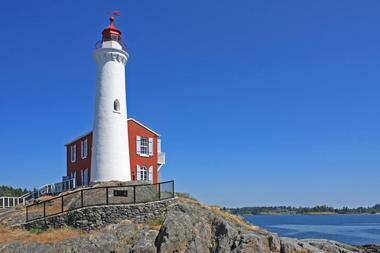 Fisgard Lighthouse is known for being the first lighthouse built on Canada's western coast. Constructed in November of 1860, the lighthouse was managed by keepers until its light was automated in 1929. 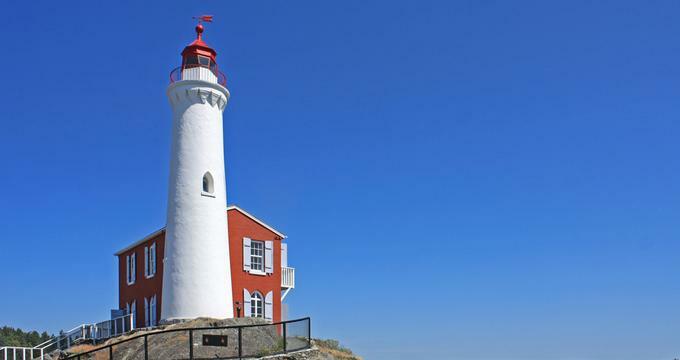 Exhibits inside the lighthouse provide information about shipwrecks in the area, the lives of Fisgard Lighthouse keepers and the inner workings of a 19th century light. There are also designated spots near the lighthouse for picnicking, photography, bird-watching and wildlife-spotting. In addition to these activities, tourists can enjoy watching the variety of boats that pass through the Juan de Fuca Strait. 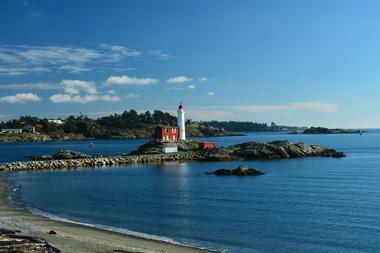 Adventurous visitors can also join a scuba diving tour in the waters beyond the Fisgard Lighthouse. Pointe Riche Lighthouse is located on the Port au Choix Peninsula, an arm of land that juts out into the Gulf of St. Lawrence. The land has a rich history which includes being home to Indians as well as English, Basque and French explorers. One of the main attractions on the peninsula is the octagon-shaped Pointe Riche Lighthouse. Constructed entirely out of wood, the lighthouse has stood above the Gulf of St. Lawrence since 1872. It first belonged to the French who occupied the Newfoundland area but ownership was transferred to the Canadian Government in 1904. 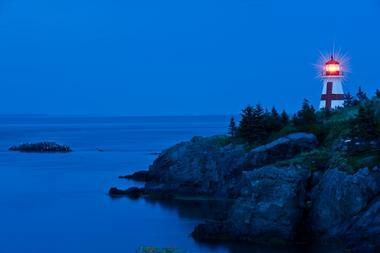 It is one of the many lighthouses along Canada's eastern coast. 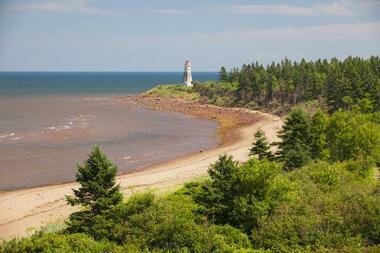 Cape Jourimain Lighthouse is located on a picturesque peninsula in New Brunswick, Canada. The lighthouse is well-known because of its unique history. From 1870 to 1949, four members of the Bent family served as keepers at Cape Jourimain. Although the lighthouse is generally accessible to visitors, the Cape Jourimain Nature Center is relocating it to protect the structure from ongoing coastal erosion. As of early 2016, the relocation project is ongoing. The Cape Jourimain Nature Center hopes that the move will preserve the lighthouse for future generations. Pictou Lighthouse is known for its distinct Scottish flair. The lighthouse was built in 1889, and its first keeper, Alexander Fraser, was paid $120 a year to man the lighthouse and to guide ships through the Pictou Harbor. Pictou Lighthouse underwent some renovations in 1896 that involved building two quaint light towers that stood less than 50 feet tall. Today, the lighthouses are managed by the Canadian Coast Guard and are not accessible to the public. However, it's possible to get a glimpse of the two towers from the nearby Harbour Light Campground. 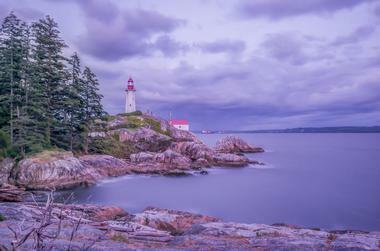 Located in West Vancouver, Lighthouse Park is a popular local attraction as well as a national heritage site. The six-sided white lighthouse, originally built in 1874, is one of the most photographed structures in the Vancouver area. The structure was reinforced in 1912 to withstand the storms blowing off of the bay. Lighthouse visitors often spend time exploring other parts of the park such as the trails throughout Lighthouse Park which provide visitors with captivating views of English Bay, Howe Sound and Vancouver Island. The park has space for picnicking, bird-watching, wildlife-spotting and more. 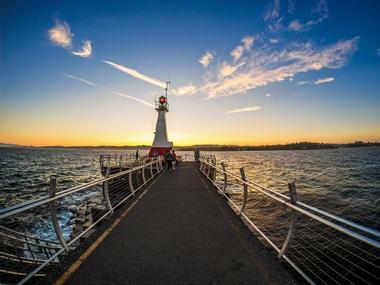 The Lighthouse at Ogden Point is the crowning feature of Ogden Point Park, a popular attraction outside of Victoria, British Columbia. A mile-long trail guides visitors along the Ogden Point Breakwater. Seals, jellyfish and starfish are just some of the interesting creatures that tourists can spot along the breakwater path. The park also offers access to Dallas Road, a beachside thoroughfare framed by the Olympic Mountains in Washington State. Visitors can also reach other historic sites from the park including Craigdarroch Castle, the Terry Fox Statue and Beacon Hill Park. Pointe à la Renommée Lighthouse was originally erected in 1860. 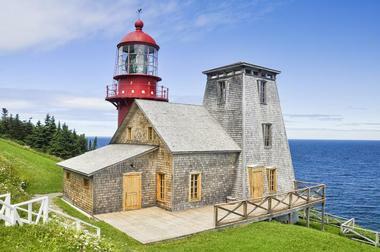 Rebuilt in 1906, the current lighthouse sits along the northern stretch of the Gaspe Coast. In 1977 the lighthouse was decommissioned, dismantled and shipped to the Old Port of Quebec City. There it stood as a popular tourist attraction until 1997, when the government decided to move it back to its prior location. 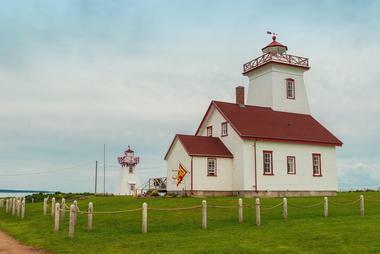 Pointe à la Renommée Lighthouse is well-known for its beautifully-manicured grounds and bright red exterior. While visiting the guesthouse, tourists can also stop by the keeper's home, which is filled with exhibits that detail the lighthouse's past. Located on the incredibly picturesque sandstone cliffs of Prince Edward Island, Cape Tryon Lighthouse helps mariners navigate the shallow waters between Richmond Bay and New London. The original Cape Tryon Lighthouse was decommissioned in 1964 and replaced with the 40-foot-tall structure that stands at Park Corner today. Lucy Maud Montgomery, the author of Anne of Green Gables, once lived on Prince Edward Island and likely used the Cape Tryon Lighthouse as a model for a lighthouse mentioned in her book Anne's House of Dreams. Cape Tryon Lighthouse was recently acquired by a trust whose goal is to preserve the seashore in the area. Head Harbour Lighthouse, also known as East Quoddy Lighthouse, was built in 1829 to help ships navigate the fog and rocky base of Fundy Bay. The second oldest lighthouse in the province, Head Harbour sits on the eastern tip of Campobello Island in New Brunswick, Canada. Known to be the most photographed lighthouse in the world, this red-and-white-striped wooden lighthouse draws scores of visitors each year. Getting to the lighthouse is an adventure in and of itself since it can only be accessed when it is low tide. Lighthouse visitors should be sure to make time to visit the keeper's house as well as the interior of the lighthouse itself. Head Harbour Lighthouse is open to visitors from May to October, and guides are available to assist guests early June to late August. Wood Islands Lighthouse was built to help guide maritime traffic through the strait between Nova Scotia and Prince Edward Island (PEI). 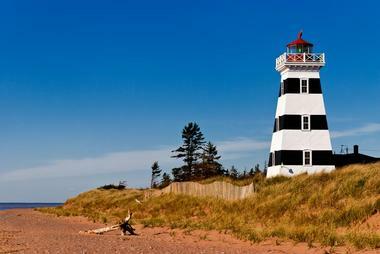 The lighthouse as well as the keeper's home still stand at the western edge of PEI near the Northumberland Strait. The lighthouse is still in operation, and the site is also home to a large interpretive museum. Wood Islands Lighthouse and the interpretive museum are open daily throughout the summer months. Admission ranges from $4 to $13, but children under the age of five get in free.